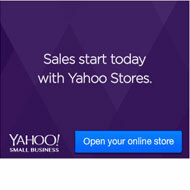 Start a Yahoo Store today with this Yahoo discount! We get the question,”Why should I sell my products on Yahoo?” So here are the top six reasons many of our members start and stay with Yahoo. 1. It’s Easy – If you can click a button that says, “Section;” you can add a new section to your store. If you can click a button that says, “Item;” you can add a new item to your store. Yes, it truly is that easy. 2. It’s SEO Friendly – Yahoo Stores are set up with CSS friendly design. That means that the back end code is nice and clean for the search engines to get to the most important stuff… your products. 3. It’s Secure – Yahoo has some of the most secure software available. Your customer’s information is also secure when you log into the administrative side of your website. Should a hacker get into your first password, they have to figure out a second password in order to view your customer’s credit card information. This helps you to be PCI complaint with your merchant account company! 4. It’s Informative – The Yahoo Store will show you where your visitors are coming from, what keywords got them to your website, and how many of them converted over into sales. This information is crucial when it comes to making the right decisions to increase your conversion rates. 5. It’s Inexpensive – For less than $40 a month, you can add up to 50,000 products to your store. Their transaction fees are cost effective. 6. It’s Scalable – Whether your business is large or small, the Yahoo Small Business platform is ready to take you to the next level. As you can see, Yahoo Stores are awesome! If you are thinking about starting a Yahoo Store, don’t take my word for it. Give it a try yourself! This entry was posted on Monday, February 4th, 2013 at 2:51 pm	and is filed under Online Business, Online Business Advice, Recommendations, What's New. You can follow any responses to this entry through the RSS 2.0 feed. You can leave a response, or trackback from your own site. This is great advice. I think the best thing you pointed out is the fact that it is scalable. I can think of 8-10 very large, profitable online stores that still use Yahoo! Stores today. It speaks volumes when you see these companies that clearly have enough money to switch to whatever provider they want or even bring somebody to run their site completely in-house but they’re still on Yahoo! because they’ve had such a great experience. One Response to Why Sell on Yahoo?